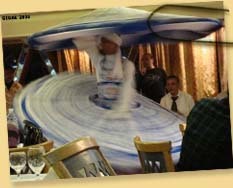 Last December (2008), I was watching this outstanding Sufi dancer on the Nile's banks. He was showing us his soul-stirring art: the Dance of our Solar System's planets, followed by the phenomena called the precession of the equinoxes, and many other things. Seeing all this, I was inevitably drawn to think about the surprises constantly brought about by the Present and the Future. 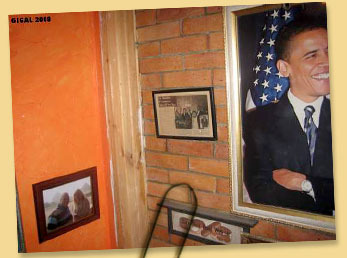 As for the Present, I had just seen my picture on the "celebrities" wall in the Egyptologists and explorers' club in Giza, next to the portraits of Temple, Bauval, Hancock, Hawass and Obama! What a combination! And regarding the Future, as I am always asked to share my thoughts on the Mayan calendar (though I'm not a specialist), as well as on the date (fateful for some people) of December 2012, I had to state things clearly. First of all, some people mix up the 17 Mayan calendars and the different Aztec calendars (I spare you very long explanations). Just be aware that the Mayan calendar everyone speaks about is called Tzlk'in (one among the existing 17) based on the Pleiades Cycle mentioned in the Mayan sacred book Popol Vuh. Which one to choose!!!???). All this data is very random in order to seriously feed a computer. Moreover, it is very strange the 21st of October 4772 is never mentioned, even though it appears in the current calculation system on this Mayan calendar. Yes, this date is written down as a celebration time, way after December 2012... On the Tablet of Inscriptions from Palenque... So anyway they didn't think the world would end in 2012!!! Are people taken for fools? Why to create so much fear? 2012 merely is the beginning of yet another journey cycle for our planet... But a cycle when we will rise towards the centre of our galaxy, for the first time in ages. This is what is so important to understand, we are finally going back to the central light of our galaxy, after centuries of dark ages, of fall and moving away from our galactic heart. This is what they want us to forget... We are living a decisive and incredible time concerning the reversal of false values... And at the end of 2012, the Earth will at last begin a new rise for a very long period... It is up to us to transform the negative from the Past into something positive, and to try to repair, transmute and regain a very needed joy.